Econoler is an international consulting firm with 35 years of experience in the design, implementation, evaluation and financing of energy efficiency and renewable energy programs and projects. Over the years, Econoler has contributed to developing and implementing about 4,000 projects in over 140 countries. Econoler has built its reputation thanks to the talents and innovation of its staff comprised of about 60 experts, including engineers, economists, financial specialists, marketing specialists and professional statisticians. Fostering energy efficiency by providing high-quality professional services that promote the sustainable use of energy resources and the fight against climate change. Econoler’s reputation is based on the excellence of her work. It is essential to expend all the necessary efforts at any level to maintain this reputation and provide the highest quality services. To respect colleagues, clients, subcontractors and other partners is essential for the good running of the company. Econoler must be in the vanguard of know-how in all her fields of expertise. Innovation has to be promoted at any time within the organization and in the context of realizing various mandates. Econoler Inc. was founded in 1981 by Hydro-Québec and a leading Canadian engineering firm as one of the first Energy Service Companies (ESCOs) in the world. Econoler rapidly expanded its operations in Canada, investing over CAD 125 million in more than 650 projects in the commercial, industrial and institutional sectors, through the use of a unique Energy Performance Contracting approach based on the shared savings concept. 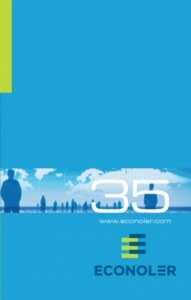 In 1985, Econoler began to export and license its know-how and the ESCO concept outside of Canada, beginning in Western Europe and continuing to various countries in Asia, and North Africa. The concept was successfully implemented in more than 20 countries overall, making Econoler one of the most experienced firms in the world with respect to designing and implementing ESCO projects. In the early 1990’s, Econoler diversified its activities in a wide range of related sustainable energy fields and focused its efforts on both consulting and international activities. The demands of this quickly evolving market implied a move away from being a functioning ESCO to devoting itself to international consulting; specializing in innovative approaches in energy efficiency, clean energy production, and the Clean Development Mechanism. Due to a management buy-back in the early 2000s, Econoler is now an independent consulting firm, no longer connected to Hydro Québec other than as a major client, primarily in the program evaluation area.